Fireworks shows are not just confined to Earth’s skies. NASA’s Hubble Space Telescope has captured a spectacular fireworks display in a small, nearby galaxy, which resembles a July 4th skyrocket. Observations of the early universe, such as Hubble’s Ultra-Deep Field, reveal that about 10 percent of all galaxies have these elongated shapes, and are collectively called “tadpoles.” But studies of the nearby universe have turned up only a few of these unusual galaxies, including Kiso 5639. The development of the nearby star-making tadpole galaxies, however, has lagged behind that of their peers, which have spent billions of years building themselves up into many of the spiral galaxies seen today. Elmegreen used Hubble’s Wide Field Camera 3 to conduct a detailed imaging study of Kiso 5639. The images in different filters reveal information about an object by dissecting its light into its component colors. Hubble’s crisp resolution helped Elmegreen and her team analyze the giant star-forming clumps in Kiso 5639 and determine the masses and ages of the star clusters. The international team of researchers selected Kiso 5639 from a spectroscopic survey of 10 nearby tadpole galaxies, observed with the Grand Canary Telescope in La Palma, Spain, by Jorge Sanchez Almeida and collaborators at the Instituto de Astrofisica de Canarias. The observations revealed that in most of those galaxies, including Kiso 5639, the gas composition is not uniform. Hubble offers a detailed view of the galaxy’s star-making frenzy. The telescope uncovered several dozen clusters of stars in the galaxy’s star-forming head, which spans 2,700 light-years across. These clusters have an average age of less than 1 million years and masses that are three to six times larger than those in the rest of the galaxy. Other star formation is taking place throughout the galaxy but on a much smaller scale. Star clusters in the rest of the galaxy are between several million to a few billion years old. The galaxy, located 82 million light-years away, has taken billions of years to develop because it has been drifting through an isolated “desert” in the universe, devoid of much gas. 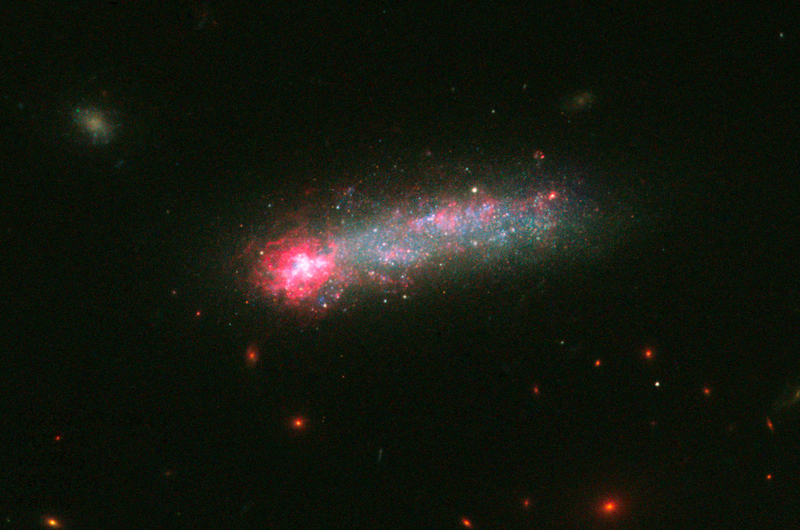 What triggered the starburst in such a backwater galaxy? Based on simulations by Daniel Ceverino of the Center for Astronomy at Heidelberg University in Germany, and other team members, the observations suggest that less than 1 million years ago, Kiso 5639’s leading edge encountered a filament of gas. The filament dropped a large clump of matter onto the galaxy, stoking the vigorous star birth. Debra Elmegreen expects that in the future other parts of the galaxy will join in the star-making fireworks show. “Galaxies rotate, and as Kiso 5639 continues to spin, another part of the galaxy may receive an infusion of new gas from this filament, instigating another round of star birth,” she said. The team’s results have been accepted for publication in The Astrophysical Journal. Other team members include Casiana Munoz-Tunon and Mercedes Filho (Instituto de Astrofísica de Canarias, Canary Islands), Jairo Mendez-Abreu (University of St. Andrews, United Kingdom), John Gallagher (University of Wisconsin-Madison), and Marc Rafelski (NASA’s Goddard Space Flight Center, Greenbelt, Maryland).